“Exquisito” means just what it sounds like … and it is. Juanillo Oliver was a native of Catalonia, Spain, who came to Cuba in the mid 1800s as a Spanish soldier. After his discharge from the military he decided to remain in the Caribbean and started his family there — raising sugarcane and tobacco for Rum and cigars. During the two wars for independence and the Cuban revolution, his family lost everything and fled to Dominica. In 1997, a few of his decedents decided to start the family Rum business once again by purchasing an inventory of existing spirit — and Oliver & Oliver was born. O&O Exquisito 1985 is really special stuff. If you remember, the “solera” method is when the spirit is shifted from barrel to barrel over time. But only a portion is moved, so that there are always elements of spirit far older than the age statement. Well, O&O Exquisito 1985 is 21 YO Solera Rum. And it is aged in the tropics, where spirits age far faster. Simply stated, this is a Rum that taste like it was made by angels. Thick, rich, and packed with flavour. 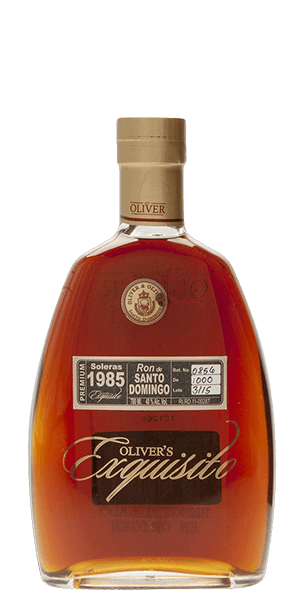 What does Oliver's Exquisito 1985 Vintage Solera Rum taste like? The Flavor Spiral™ shows the most common flavors that you'll taste in Oliver's Exquisito 1985 Vintage Solera Rum and gives you a chance to have a taste of it before actually tasting it. Dominican GEM! This is sipping Rum that will change your Rum experience. Perfectly paired with a medium-full bodied cigar.